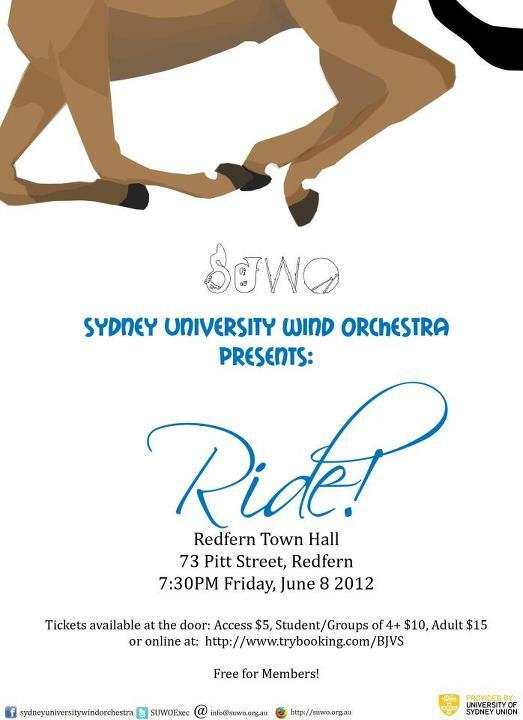 Showcasing 12 brilliant pieces that explore the theme of Movement, the Sydney University Wind Orchestra is proud to present ‘Ride’. Join us for a spectacular concert featuring the 50+ members of the ensemble and our new 2012 conductor, Dr Steven Capaldo. $10 each for groups of 4 or more. We will be drawing our semester raffle at this concert. Prizes include 2 tickets to the ACO, Bottles of wine, a $50 JB HI-FI gift card. Tickets are $3 each or 2 for $5 and can be bought at the door. Email info@suwo.org.au for more information.